Last Friday, I used one of my MIT release days to collaborate with a fellow MIT teacher, Kent Somerville (check out his inquiry blog here). We decided to create a high order thinking reading unit around our inquiry focus - The Titanic. - Provide student the opportunity to extend school journal text read, with online readings and further text. - Give students rich 'creating' opportunities in order to strengthen learning. - Stay away from low level 'digital worksheets' and give opportunities to learn from text and across texts to explain/reflect/show learning through creation. This feedback provoked a lot of thinking and caused a total mind shift in my pedagogy. I had a eureka moment! I have been taught this way myself at school and had been taught how to teach this way… Good old photo copied worksheets from black lined masters and in worst cases digital worksheets. I am also feeling quiet embarrassed that I didn't make this change in pedagogy sooner, I know that Blooms and SOLO have been around for yonks! It is now time to wake up and smell the roses and realise, that I am getting closer to shifting my class, to one of high order thinking. 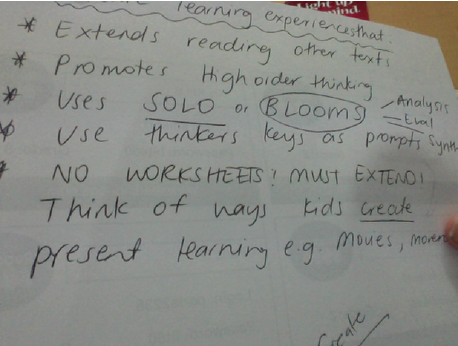 We chose to focus on 'evaluation' from Blooms levels of thinking. In the first session we got the students evaluate and assess the value and importance of 'thung chai' (basket boats) to the people of Vietnam. In the second session, students had to assess the value and importance of the Titanic to the people of the UK. Then finally in the last session, students had to assess why boats were important to different communities. So there you have it, I am finally feeling like I am getting somewhere! Now to bring it into the classroom!